This 14K white gold Claddagh necklace features 44 individual round brilliant diamonds that are set in the heart along with the cuffs and across the top. 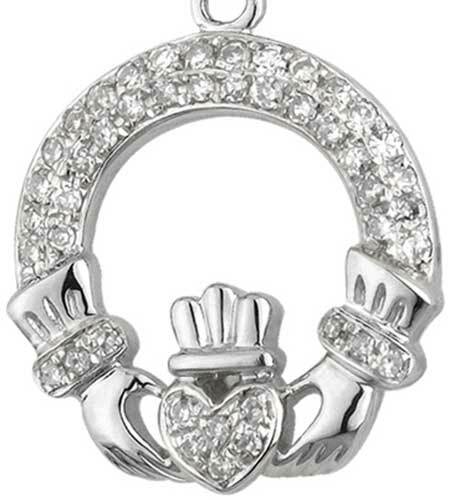 The stones in the diamond Claddagh pendant have a clarity grade of SI 1-2 and are G - H on the color scale and have a total diamond weight of 0.22ct. 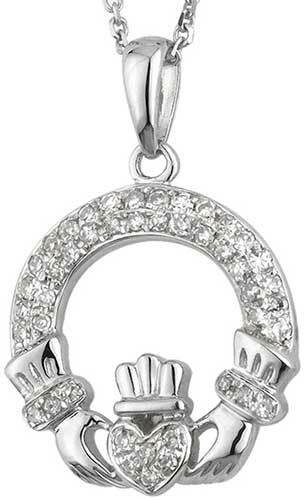 The diamond Claddagh necklace measures 5/8" wide x 7/8" tall, including the jump ring and the chain bail, and it included an 18” long 14K white gold chain.